"Use small home plans to build a house... Just right for you!" Small house floor plans are very popular with first time home builders, small families and retired couples that are interested in living in smaller accommodations. The "required" living area is the key point here; if you have a large family or storage needs, then a small house is obviously not the way to go. 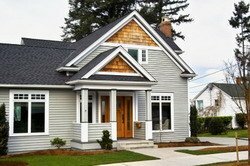 Many people want to build small in order to save money, but looking at your specific size needs (and wants) is critical before deciding if you are going to build a small, medium or large home. Special consideration should be given to the home layout, in order to ensure the feel of the house in not cramped. In large urban areas, where building property space is often limited, building a small home is a great way to make use of small properties that may be available in popular neighbourhoods. The interior design of the small house should also not be overlooked, it this will play a key role in emphasizing the spaces to feel bigger than they actually are. By complimenting the interior of the home with furnishings and decor to give the dwelling a comfortable yet uncluttered feel, a house with a smaller square footage can still offer the home-owners everything they need. When shopping for a set of small home floor plans, buyers need to also be aware that certain modifications to the construction drawings may need to be made in order to satisfy the local building controls office. A set of scaled plans will need to be shown to the local municipality before a building permit can be issued. Often times, plans that are purchased through the internet will need to have these important changes made as house building requirements can vary widely, from town to town. If you have purchased a set of house plans and are in need of a service to make changes to your blueprints, in order meet your local building requirements, please feel free to contact us for a small house floor plans quote. We will be happy to work with you to help you get your required building permit by providing professional CAD drawings of your small house floor plans. Simply e-mail us, or fax us, your small home plan ideas, concepts, requirements, images and sketches to help us better understand your needs. Remember, small home living does not need to feel small. So be sure to choose your set of small house floor plans carefully, consider your entire family's needs and don't be afraid to get creative with your smaller accommodations.